A section of the mural. Lucy Gellman Photos. Seventeen women now look out benevolently on the Farmington Canal Heritage Trail. In their hands, they hold bright and blazing torches, small children, thick volumes of history, the pages of which we can only begin to imagine. They carry themselves high, shoulders squared against the sky, feet planted firmly in the ground. And, for the first time in two years, they are complete. Wednesday morning, artist Kwadwo Adae celebrated the completion of his “Women’s Empowerment Mural” on the trail, painted on a vivid, 18 x 108 foot building owned by Tri-Con Construction LLC at the New Haven-Hamden border. Over 100 friends, family, funders and nonprofit partners gathered for the celebration, held at the mural’s 400 Goodrich St. location. It is his second mural on the Farmington Canal Heritage Trail. The first, a bright 8 x 32 foot “Elm City Footraces” mural commissioned by the city, was completed in 2016. It still sits tucked behind Shelton Avenue, between Hazel and Starr Streets on the side of Newhallville resident Calvin Nelson’s garage. Adae (center) with Khushi Malhotra and Katie Jones. 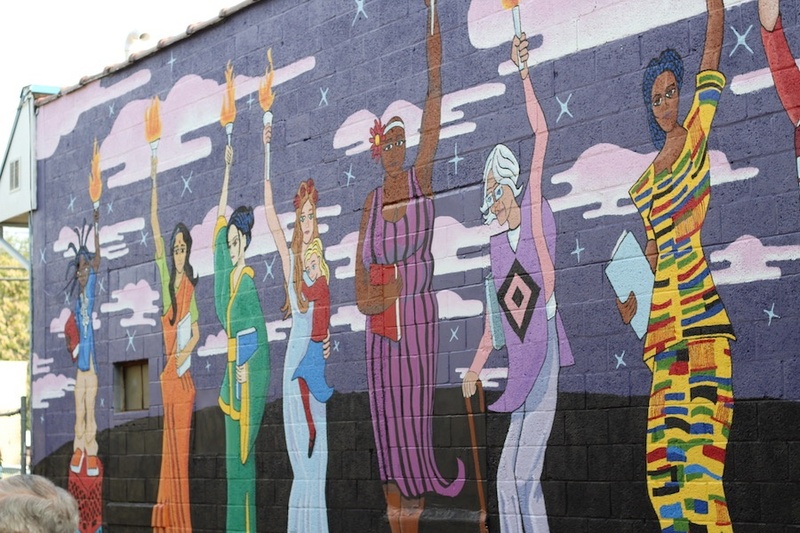 Adae laid plans for the Women's Empowerment Mural earlier this year, after scoring a special projects grant from the Connecticut Office of the Arts and holding three public forums on the project. Additional funding came in from the Farmington Canal-to-Rail Association, Yale New Haven-Hospital, Newhallville Safe Neighborhood Initiative, Neighborhood Housing Services of New Haven, William Caspar Graustein Memorial Fund, and REI Co-Op. Since early June, Adae has been working on the piece almost daily, with assistance from over 150 community volunteers. He finished the final touch, a sprinkling of stars in the night sky, on Tuesday night. The mural has been years, and not months, in the making. Adae first conceived of the design in January of last year, during the Women’s March in New York City. President Donald J. Trump had just been inaugurated, and Adae felt anger, rage, and fear for himself and for the women in his life. When he returned to New Haven, he applied for a $12,000 grant from the Office of the Arts. The money came through this February, 13 months after he had started thinking about the project. He was one of just three artists to score funding this year, said CoA program specialist Tamara Dimitri. At the time, Adae and his assistant Toni Giammona had prepared designs for nine models, a mix of real and fictional women who had inspired Adae. There was a young Black youth, standing atop two milk crates and looking out onto the world in front of her; a Japanese woman, arresting in an emerald green kimono, who Adae had met at a Coming-Of-Age ceremony in Japan in 1995; his real-life friend Khushi Malhotra, a meditation instructor who accompanied him on three international mural-painting trips; Westville artist Hanifa Washington; youth organizer Katie Jones, holding a younger version of herself; his Chicago-based sister Nana, wrapped in bright Ghanian kente cloth, and others. Stetson Library Branch Manager Diane X Brown. 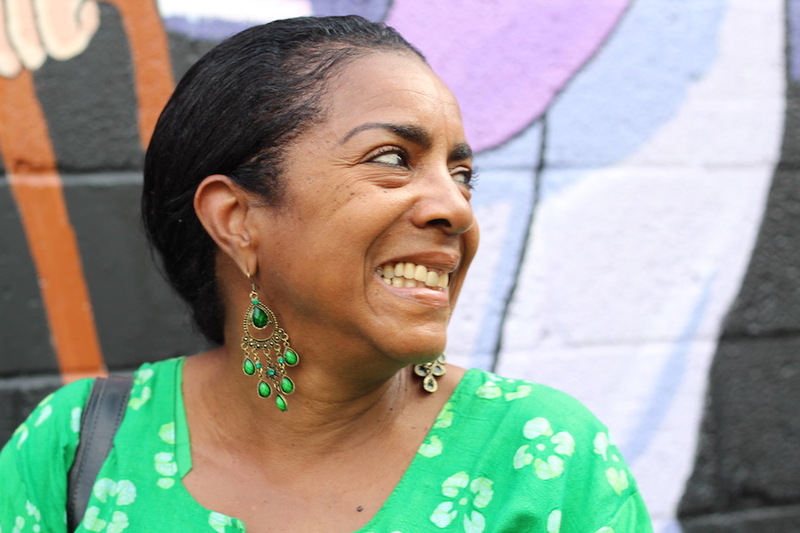 As Adae started painting, more funding came through, and the wall seemed to grow in size. From nine figures, 14 made their way onto the wall. Then that number became 17. 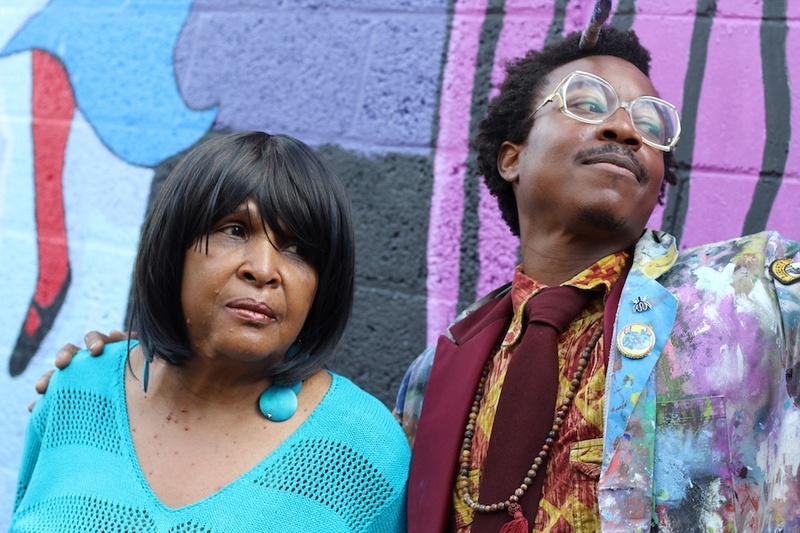 Adae added neighborhood heroes: Newhallville matriarch Florence Caldwell, Stetson Library Branch Manager Diane Brown, and his hematologist at Yale-New Haven Hospital. 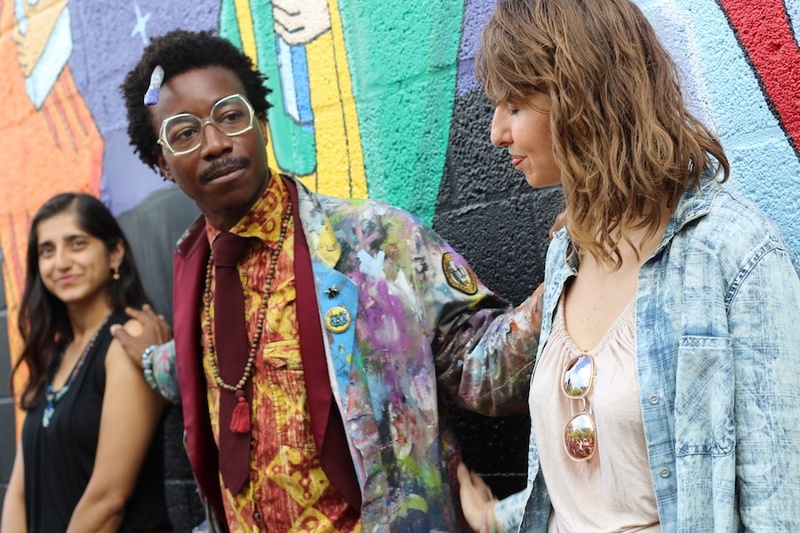 He watched as Trump promised to reverse policies for transgender rights, adding a representative of the trans community to the mural as he dug into art as a form of resistance. “We can’t continue the status quo if half of our population doesn’t feel safe,” he said. Speaking for over half an hour, city officials and neighborhood advocates praised Adae’s work, noting its potential to bring community together and get people out on the trail. Emceeing the event, Farmington Canal-to-Rail Association President Lisa Fernandez called it part of a nascent arts corridor, where 100,000 people will be able to “walk into art, to bike into art, to blade into art” every year. With some pint-sized viewers from Harris & Tucker Preschool in tow, Newhallville Community Management Team Chair Kim Harris thanked Adae for his work, and its power to light up the community. 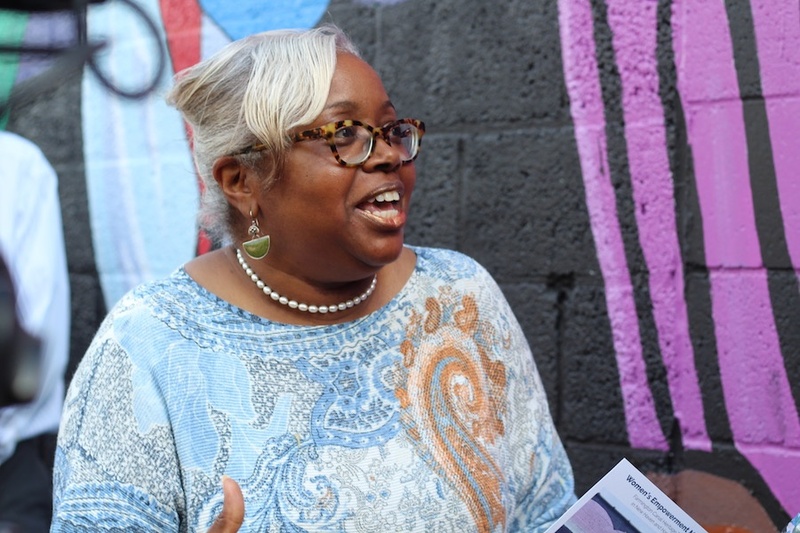 Newhallville Alder Delphine Clyburn praised it as “a river of life” flowing through the community, that placed women front and center, and gave Newhallvillians a chance to come together. Porter: "Women are the rock and the foundation of the community and the village." Justin Farmer, who represents Hamden’s fifth district, added that he sees the work as a chance for community to come together. 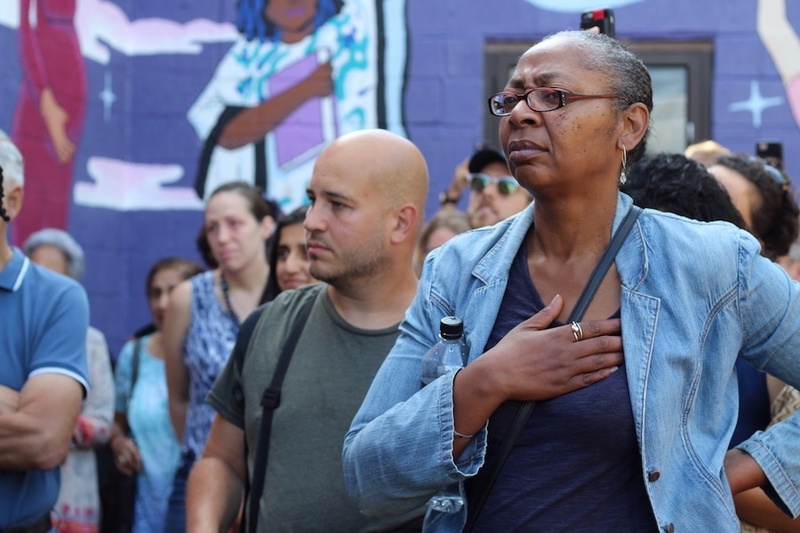 He recalled the pain he felt last November, after 18-year-old Lee'Andre Cousins-Benton was shot and killed blocks from the mural site, just six days before his 19th birthday. This summer, Farmer made time for the mural almost every day—not because it was in his district, but because he was moved by Adae’s work. Adae with Florence "Flo" Caldwell. To great cheers from the audience, several of the women featured joined Adae in front of the mural, posing underneath their likenesses. Among them were Jones, Washington, Caldwell, and Tiffany Lee—rendered eight months pregnant in a flowing gown, the image of motherhood itself—with her new baby, named Independence. 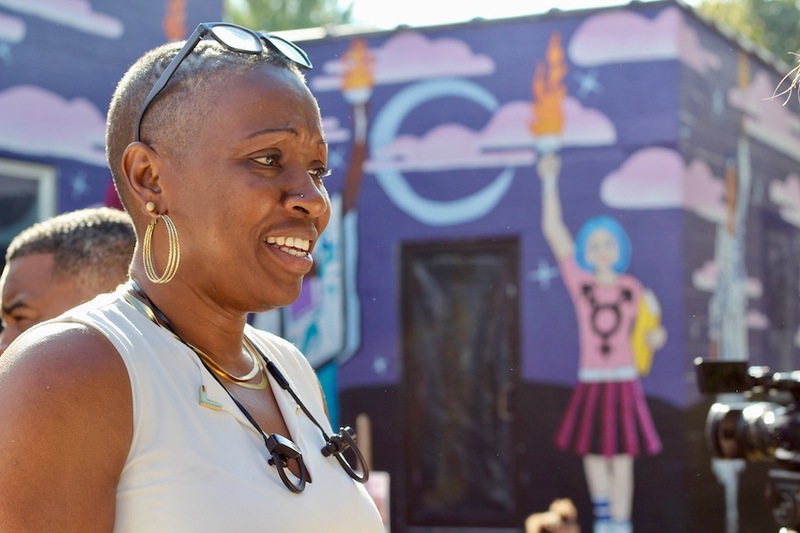 “I want to see more artwork on the trail, and in these neighborhoods that could use some healing,” Adae said as they gathered around. He recalled the shock of seeing the wall for the first time, covered in light blue paint and scrawls of black graffiti. All it needed, he said, was a little bit of love from the community, in the form of 17 gallons of primer, thousands of dollars of paint, and hundreds of helping hands. To watch the ceremony, click on the Facebook Live video from our colleagues at the New Haven Independent, below. We've also linked to our previous coverage of the project, which began in early March. And there are more photos of the mural on our Instagram, so check us out @newhavenarts!